The Mayweather/Pacquiao fight, a rare Showtime-HBO co-production, drew big names from Hollywood and beyond on Saturday night. 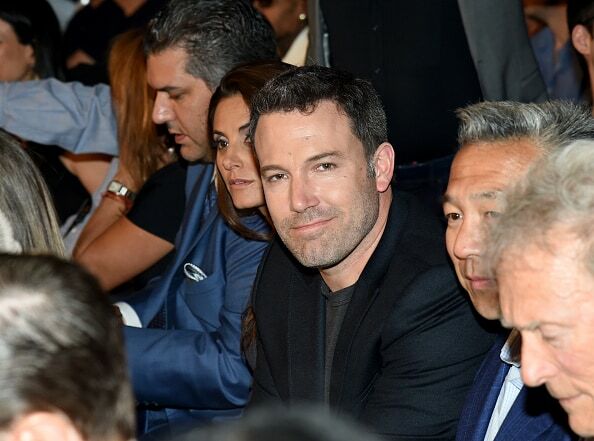 Ben Affleck sat with Warner Bros. CEO Kevin Tsujihara. 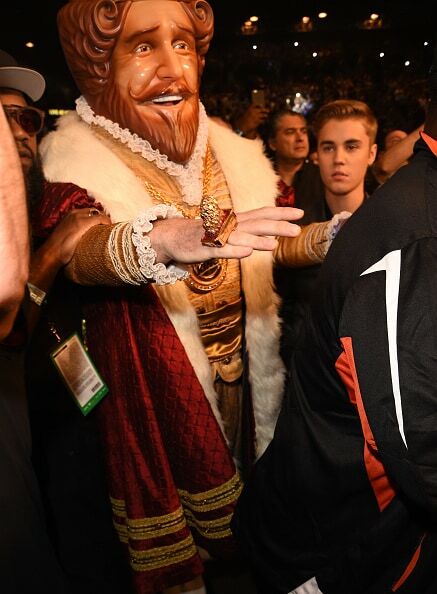 Justin Bieber lost his #1 spot in Floyd's entourage to the Burger King, who trended on Twitter throughout the fight. Earlier in the day, the Biebs also lost his shirt. He still had a headlining role at the Hard Rock, where he sprayed the crowd with champagne, hung with Vine star King Bach, and sang his Jack U collaboration "Where are U Now" at REHAB. We're not sure what weight class this is. Meanwhile, Bradley Cooper (+11) made his second trip to the Encore Beach Club/Surrender complex in as many months. David Guetta was impressed by his french. Coop hung backstage in Guetta's table and wore that same Eagles hat to the fight later on Saturday. At the main event, Diddy (with girlfriend Cassie) wasbstyled by Ilaria Urbinati for the fight. While Mark Wahlberg was not (styled professionally). Both Wahlberg and Diddy had official roles in promoting the fight while promoting their shared water brand (see Mark's T-shirt). Once (and future) "The Fighter" caught up to the next big feature fight team: "Southpaw" director Antoine Fuqua and a buff Jake Gyllenhaal. "Raging Bull" Robert DeNiro has Nobu and a Nobu Hotel in Vegas. Jay-Z's music streaming service Tidal has a record of 0-1. He has taken jabs from the public since the launch. Back in the day, Donald Trump used to get the big fights at his hotel in Atlantic City. That was around the time that Drew Barrymore was a really, really big deal. After the fight, Drew and husband Will Kopelman went to see Calvin Harris at Hakkasan (also inside the MGM). For Harris, it was back to back weekends, having played Omnia 8 days before. Liev Schreiber was the glue in this freak Showtime-HBO co-production. He stars on "Ray Donovan" and did voice over narration on an HBO behind the scenes doc leading up to the fight. Stephen Moyer and Anna Paquin were fighting out of the HBO corner. Diane Kruger and Showtime's "The Affair's" Joshua Jackson. Jerry Bruckheimer... what's your affiliation? Oh yeah, "The Amazing Race" and "CSI," both on CBS. Speaking of CBS, Les Moonves and Julie Chen sat with one of CBS' ratings gasoline suppliers: New England Patriots owner Robert Kraft. Arriving from the Kentucky Derby, social media thought Tom Brady looked hungover and/or "spirited." Bow Wow is thrilled to meet Don Cheadle. With so many celebs and a 12 round fight that went the distance, many blended into the crowd. Adrien Brody avoided coverage on the international telecast. Denzel Washington went very casual in a track suit, hanging with "Training Day" director Fuqua. Netflix's Ted Sarandos probably already has a lock on the SVOD window for "Southpaw" based on their deal with the Weinsteins. There's no disputing who "Person of Interest" actor Kevin Chapman is supporting. The TV announcers incorrectly identified Michael Keaton (left, with Sugar Ray Leonard) as an Oscar winner for "Birdman." The movie won. He did not. Nikolaj Coster-Waldau's big night is Sunday, when "Game of Thrones" airs on HBO. 50 Cent hit the trifecta, making appearances Friday, Saturday, and Sunday around press for "Southpaw". The day after the fight he performed with Jeremih at Foxtail, the pool club at the SLS. Diddy is the champion of marketing. He brought a Ciroc belt to Foxtail a day earlier for a party with Sports Illustrated swimsuit models. Before fight weekend, "Dangerous" producer David Guetta electrified the crowd at Encore Beach Club at the Wynn. His Saturday afternoon set had hands going up. Questlove and Miley Cyrus broke in the leather on the VIP couches inside the new Omnia at Caesars (the latest from the Hakkasan guys). "All about the Place (not Bass)" for Meghan Trainor, partying inside the Heart of Omnia, the more exclusive nook inside the new space at Caesars. When Bradley Cooper, Jonah Hill, and Miles Teller were in town shooting Todd Phillips' "Arms and the Dudes," they spent the night with Lil Jon at Surrender last month. Las Vegas native and Imagine Dragons frontman Dan Reynolds signs a bike on the way to a Vegas Magazine event at the Four Seasons. Reynolds and Imagine Dragons front the spring issue of the glossy Vegas mag. Pool season started way back in March for former "Real Hosuewife" Alexis Bellino, a regular at Encore Beach Club at the Wynn. Brody Jenner and William "J Dub" Lifestyle recently began a residency at TAO in Las Vegas. The massively popular Encore Beach Club at Night (Thursdays) is back for 2015. Major Lazer, Jermaine Dupri, Martin Solveig, Flosstradamus, and Dillon Francis are among the headliners in May and June.